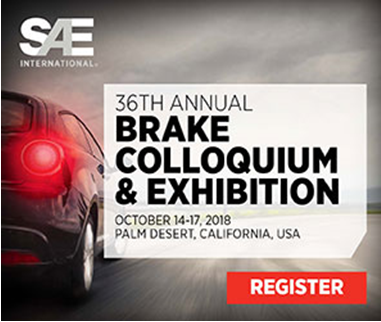 Atotech will be attending the 36th Annual – Brake Colloquium & Exhibition this October 14-17 in Palm Desert, CA! Join us and use the opportunity to make in-person connections with Atotech’s experts for corrosion protection and brake components. Today, Atotech is the global leader in electroplating chemistry for brake calipers as well as for all other components of state of the art brake systems. This makes us an ideal partner for the automotive industry. At our general metal finishing division, we pay special attention to the needs and demands of automotive manufacturers, OEMs and their suppliers. Numerous Atotech processes fulfill the requirements of a substantial number of OEM specifications and are approved by automotive manufacturers and brake caliper Tier 1s worldwide. Join our booth no. 510 to discuss the relevant technical topics on braking and brake systems for light- and heavy-duty OEMs and aftermarket customers with an emphasis on emerging technology. Atotech’s brake expert Dr. Matthias Hoch will also participate in the technical program. Tuesday, October 16 I Room Salon A-F 8:00 a.m.I Presentation 8:40 a.m. The SAE Brake Colloquium & Exhibition is the premier brake event in North America. At this event, you will have the opportunity to network and interact with engineers, quality control, research and development professionals, and discuss the latest challenges impacting the industry. Join us October 14-17 in Palm Desert, CA!